✱ Preheat the oven to 200°C (400°F/Gas 6). ✱ Heat the olive oil in a flameproof casserole dish. Add the beef and brown on all sides over high heat. ✱ Remove the beef from the dish and set it aside on a large plate. Deglaze the casserole dish with the white wine and scrape the bottom of the dish well using a spatula. Add the onions, sugar and bay leaves and cook, covered, until the onions are soft. ✱ Return the beef to the casserole dish. Add the butter, cover, and roast in the oven for 25 minutes. 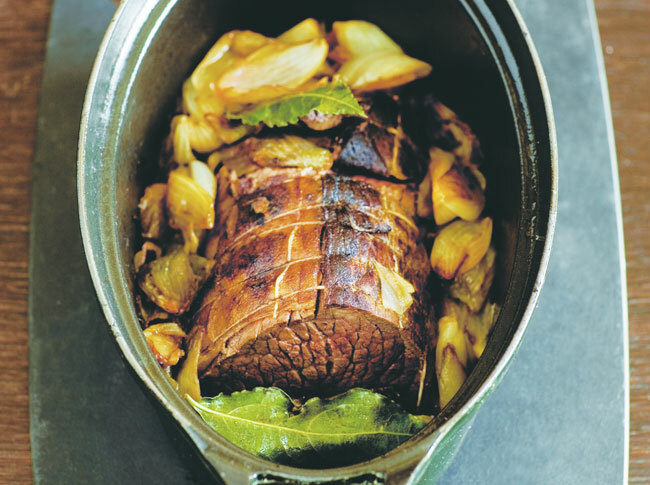 ✱ Remove the roast from the oven and allow the beef to rest in its juices, covered, for 10 minutes, before serving. ✱ Preheat the oven to 180°C (350°F/Gas 4). ✱ Peel 1.5 kg (3 lb 5 oz) of potatoes, six onions and six garlic cloves and slice all of them into thin rounds. Rinse the potatoes. ✱ Butter a flameproof roasting tin. Make a layer of potato, add a few slices of onion and garlic, a bay leaf and a few small thyme sprigs. Repeat the process several times. ✱ Cover the potato with 1 litre (35 fl oz/4 cups) of vegetable stock and bake in the oven for 45 minutes. 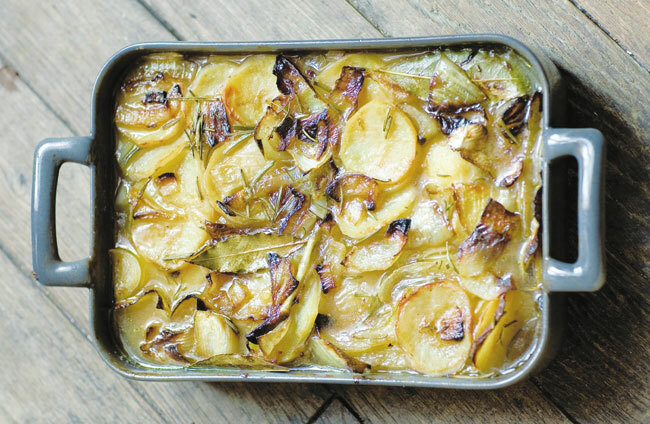 ✱ Pour any meat roasting juices over the gratin just before serving. ✱ Peel 1.5 kg (3 lb 5 oz) of potatoes, then slice them into thin rounds. Rinse the potatoes to remove all the starch, then dry them with a cloth. ✱ Rub a flameproof roasting tin with a clove of garlic and fill with the potato slices. ✱ Mix 1 teaspoon of nutmeg with 1 litre (35 fl oz/4 cups) of cream, season with salt and pepper. Pour the mixture over the potato and bake in the oven for 1 hour. ✱ Bone the chicken Maryland leg quarters, retaining the leg bone and as much of the flesh as possible. ✱ Rehydrate the dried mushrooms in boiling water, then drain. ✱ Heat two tablespoons of olive oil in a frying pan. Add the shallot and cook until softened, then add the mushrooms and cook for five minutes. ✱ Put the chicken breast, cream, dates, apricot, hazelnuts, chives and mushroom mixture in a food processor. Blend until combined ingredients form a smooth stuffing mixture. ✱ Season with salt and pepper. 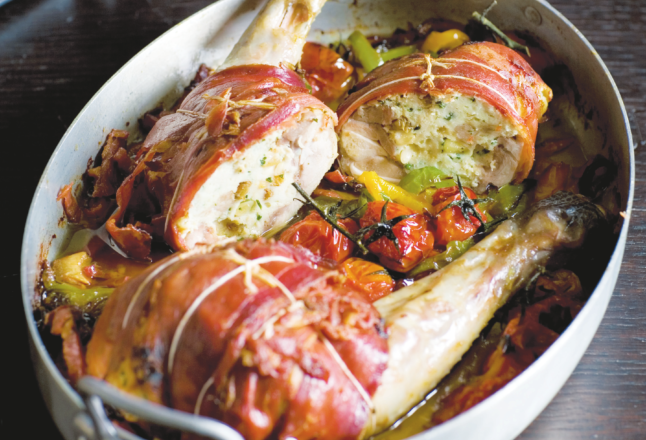 ✱ Stuff each chicken thigh with the stuffing mixture, then wrap a slice of prosciutto around the thigh and tie with string. ✱ Heat two tablespoons of olive oil in a flameproof roasting tin. Add the peppers and brown over medium heat. Remove from the heat. Drizzle generously with a little more olive oil, then lay the chicken thighs on top. Bake for 35 minutes in the oven. ✱ Remove from the oven and add the cherry tomatoes and return to the oven to roast for a further 10 minutes. ✱ Heat the butter in a flameproof casserole dish. Add the pork and brown on all sides over medium heat. Add the spring onion and the leek. Add half of the wine and season with salt and pepper. Reduce to a low heat, then cover and cook for one hour, making sure there is always some liquid in the dish. Add the turnip, potatoes and the rest of the wine, and cook for a further 20 minutes, covered. ✱ Meanwhile, warm the cream over low heat. ✱ Transfer the pork onto a serving dish and arrange the vegetables around it. ✱ Add the warm cream to the casserole dish and reduce the sauce over low heat for 10 minutes, until it thickens. Remove from the heat. ✱ Put the sauce, mustard and egg yolks in a food processor and blend until well combined. 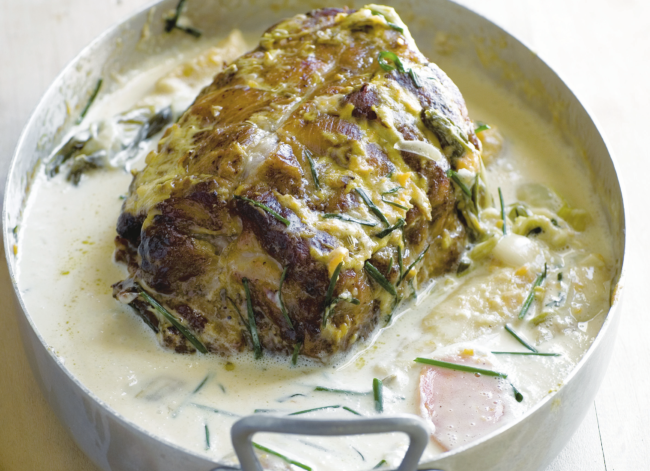 Pour the mustard sauce* over the roast and garnish with the chives before serving. *Note: The sauce can only be reheated over a very gentle heat, not more than 85°C (185°F); otherwise it will curdle.